The spent wings look a bit like the scales of a fish. They are brown or brownish-yellow in color. If you see what you think are termite wings in your house, call an exterminator near Glendale immediately to perform a termite inspection. The earlier you catch an infestation, the more likely the termite treatment will be to work. Shed wings from the reproductive cycle are not the only sign of termites present in your home. Plus, by the time the reproductive class has reached maturity to perform the swarming and mating, the rest of the colony has been chewing its way through your home and causing significant damage. Other signs of termite infestation can include termite waste (might look like soil or dirt), dirt tubes near the foundation of your house or in the ground around the house, cracks on the walls, peeling paint, or weak spots on the floor. But you don’t have to wait until you see signs of a problem to call an exterminator. A regular Glendale termite inspection should be a part of your routine home maintenance. An inspection from a qualified professional can discover termites deep in the recesses of your home where you would never find them yourself. Varsity Termite and Pest Control can develop a termite pest control plan that will keep your Arizona home free of these destructive pests. Our plan includes routine inspections and treatments to get rid of any termites that are already in your home and to keep out new termites. We have a range of effective termite treatment near Glendale options, including non-toxic options. Our exterminators will also help you make changes around your home that can prevent re-infestation. 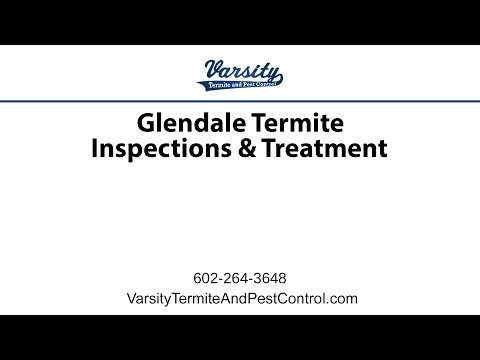 Call us in Arizona today to schedule your termite inspection and to get the termite treatment you need.